Laughing at yourself relieves a lot of stress. But as you say, you have to catch yourself ‘after the canoe’ dumps you. John Maxwell said it “Attitude defines Environment, Environment defines outcomes.” Laughing at yourself does that for me when I’m taking myself too serious. Thanks for your writing wake up call. This is a really uplifting post. I agree that starting off the day with a positive statement can really set the tone for a good day, no matter what it may throw at you. Personally, I will try and list at least 1 thing I’m looking forward to today even if it’s something small or silly like going out for my favorite lunch or wearing a new outfit. Pingback: Call Me Maybe- Just Makes Me Happy!! It Is The Perfect Song For Summer! Sometimes We Just Need To Laugh! Just Purchased On I Tunes! Psalms 118-24 This is the day that the Lord has made; « Taking On A Cause by Patsy McCaw-Yager,Englewood, Fl. I remember that day well. And many other equally funny days with you, Peggy. Thanks for teaching me to appreciate the value of a good laugh. It can get you through almost anything. The Twisted Sisters have helped me get through so much, including cancer and the loss of my husband of 42 years. You are so on target. 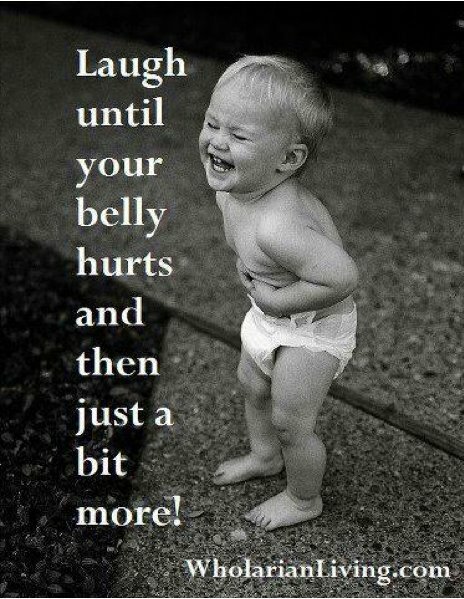 If you are the first to laugh at yourself, you will be so much happier in life. I”m a big fan of laughing every day.